Living in a van down by the river at 35 years old was a sign of failure in Chris Farley's 1993 SNL skit. The web browser and world wide web had only just been launched and the closest thing to the Internet for most people was a painfully-slow dial up modem connection to AOL or CompuServe. Laptops were very expensive and yet only had grayscale 640x480 screens. Road trips required paper maps and printed guidebooks to figure out where to eat and stay. Cell phones were only good for voice calls and cell coverage was limited to cities. Smartphones, nationwide unlimited high-speed cell coverage, social networks, and apps have changed everything. Now it is easy to find the best places using user recommendations, navigate using GPS and offline maps, and tether a laptop to a smartphone's unlimited internet connection to work remotely. Cheap and reliable hosting services like AWS make it possible to run a business online for the cost of coffee in San Francisco. Tech companies have realized that it is hard to recruit and retain talented employees in major urban centers and are now more willing to hire remote workers. It is easier to concentrate on complex tasks in a library or in a peaceful forest camping site than in a crowded open office. Inc magazine was a great resource when I started my first company in 2001. That company never got off the ground for the dumbest reasons even though the service I built to sync files across PCs, the web, and mobile devices was right on. Lesson learned: when people you trust say a problem is already "solved" by someone else, they might not understand the problem or why the "solution" doesn't work for regular people. I realized that I couldn't start a disruptive company alone, and I thought joining a profitable Internet company would help me meet future cofounders and teach me more about the keys to success. My first week at Expedia, I worked with Tom Seery, at the time a planner for the hotel business unit. Expedia turned out to be a case study of a web 1.0 company that was bogged down in process, so I took my former manager's advice and left for a startup. That company's meteoric rise and fall taught me to stay focused on revenue and expenses since most companies fail because they ramp up expenses faster than revenue and run out of money. 4 years after meeting Tom, I joined him as a technical co-founder at RealSelf. Turning an idea into a company on the Inc 500 list of Fastest Growing Companies remained a goal since the list is ranked by 3 year revenue growth, not vanity metrics. Making the Inc 500 is especially important for companies that are mostly self-funded since they miss out on all of the business press each time a funding round is announced. Often the CEO gets a lot of positive feedback about the company but other employees and people who are considering applying or joining don't. Recruiting is critical for growing companies, so every award helps. 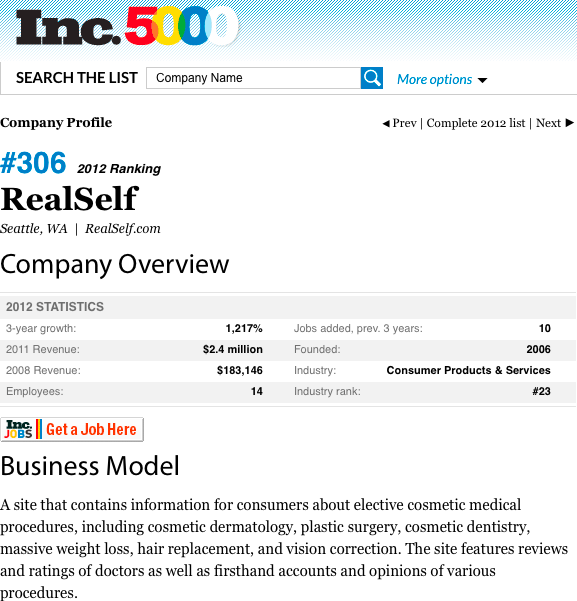 Here it is: RealSelf is #306 on the 2012 Inc 500 with 1,217% revenue growth from 2008 to 2011. 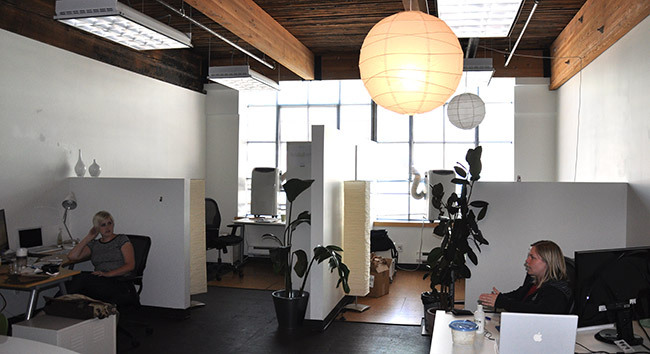 Read about the reasons RealSelf became one of the fastest growing companies. 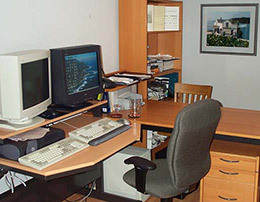 And here's a photo of the 2008 shoebox office, furnished with IKEA and second-hand air conditioning units. Then I read Gates, the gripping biography of Bill Gates' introduction to computers at the private Lakeside School in my hometown of Seattle. Lakeside was one of the only schools that had access to a computer in 1968, and Bill Gates learned how to code and met his future cofounder of Microsoft there. It was an inspiring story, so I chose Lakeside. Growing up in Seattle with Starbucks and other coffee stores on every corner, it was easy to develop a serious coffee habit. Every company I've worked for since college has provided automatic coffee machines which grind and brew a fresh cup at the press of a button. The elevator slows to a halt, the doors open, and I exit. I follow the beige carpet to the left, past the office of the Washington State Bar Association, and to an oak door with a large glass window. I fumble for my keys, find the right one, insert it into the lock, and <click>, the door opens. I enter the unlit waiting room, oblivious to its trendy décor of slate and maple, hidden by the darkness. I follow the serpentine hallway to the room containing my cubical, and sit down. As a summer day in Seattle, it is a balmy 50 overcast degrees. I press the power button on my computer and watch as its loads Windows 95 into RAM. 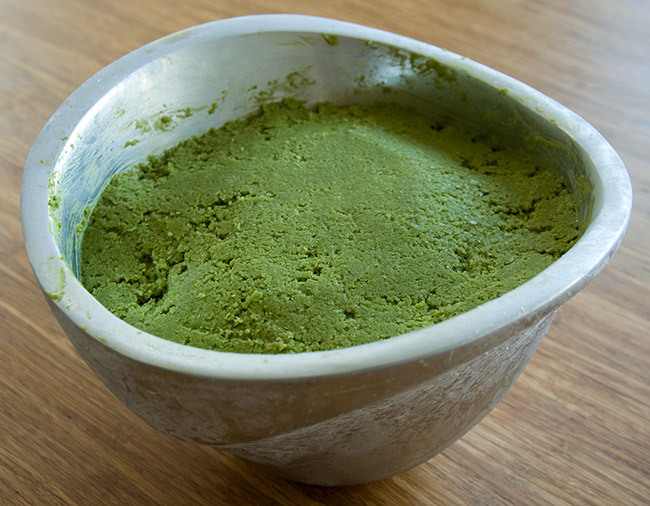 I open the program I use to create websites and start to work. It is 7:35 AM, and this is clearly going to be another fun-filled day at a thriving, dynamic startup. After the other employees file in, I notice that there are fewer than there were last week. Two--out of a total of seventeen--were laid off. One was my program manager. When everyone has had their caffeine hit-- PowerBars are also available for those desperately in need-- we move into the central meeting room with its undersized and overpriced table. The president, a graying and balding man of 50, reclines in his chair, reconsidering his State of the Startup speech. He begins by briefing us on the current projects. Microsoft-OEM is nearing completion, the TrafficView site is running and appears to be bug free. We all smile wanly as the TrafficView developers roll their eyes. Next he re-introduces our venture capital contact, a short guy with a beard named John who likes to talk about the New Paradigm. John notes that our notion that we could get venture capital easier than a STD was a little over-optimistic, but reassures us that "the wheels are in motion." A number of funds have found our outfit interesting, and are in the "due diligence" stage. Then the Chief Financial Officer, who is also the Vice President of Sales and Marketing and Plain Old Diane, notes that given our current "burn rate," we will run out of money in two months. She looks over at the short guy named John. He shifts in his seat a little and remarks that, if all goes as planned, we could have venture capital in as soon as a month and a half. In 2001, I tried to start a business based on code I had developed for Yale to enable online registration and management of yearly class reunions. Reunions are multi-million dollar events, and the system I developed in 1999-2001 was used to manage Yale's reunions for 15 years until it was replaced by a Salesforce-based system. I used AP credits to skip a semester and flesh out the idea further. I set up an office in my mom’s basement and set to work writing the business plan. Ultimately, I concluded that universities were so slow moving that I would need a partner (or acquirer) for help with the sales process. My colleagues at Yale helped arrange a meeting with the company who was building their alumni network. The dot-com bust was already in full force, and then 9/11 happened. The company thanked me for my presentation but passed. I wasn’t passionate about event registration, and there was already a well-funded competitor (Cvent.com) that I correctly predicted would dominate the space. As with most startups, my initial idea wasn’t great. On the bright side, I identified a problem that most people had yet to experience – synchronizing documents across multiple devices. You’ve heard of DropBox, right? Well, this was 2002, and DropBox was founded 5 years later. Sure, you could use rsync to sync your files, but it was too complicated for 99.999% of people. The primary reason for DropBox’s success is its simplicity. Rsync is complicated to configure, prevents people from sharing files with friends and won't let you access files on a public computer. I decided to start from scratch and create a synchronization system that used the protocol that web browsers and web sites use to communicate so you could access your files with any browser. John Battelle and Fred Wilson have written great posts explaining why the surge in valuations and VC rounds raised by Internet companies is very different from the 1999-2000 bubble. Most entrepreneurs are naturally optimistic. I’ve been working at startups for 15 of my 30 years, and I’ve seen a lot of companies fail outright or fail to reach their potential. That includes shutting down a fledgling business I started in 2001 because timing wasn't right for the idea. So believe me when I say I'm more pessimistic than most entrepreneurs. 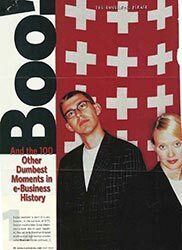 It's easy to forget the details from 10 years ago, so I scanned a list of the 100 Dumbest Moments from 2000 to put the current boom into perspective.